France's Model Health Care For New Mothers Generous paid maternity leave, free in-home nurse visits, subsidized child care — sound like a mother's paradise? It's just regular care in France. Two American mothers find that the U.S. health care system can't compete with France's model standard. The United States spends an average $6,402 per person annually on medical care. France spends about half that — while providing better maternity benefits and complete coverage for people with conditions such as diabetes and cancer. Compare the systems. Mary Lou Sarazin holds her baby, Ludivine, in Paris. 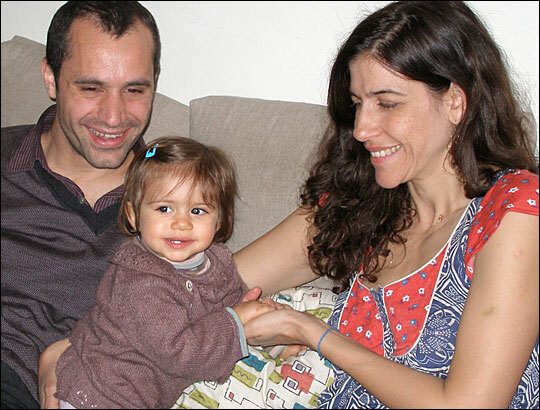 Tanya Blumstein and Tomas Lacronique play with their daughter, Ella. Nurse Nadege Heurtebise visits a young couple and their two-week old baby in Chartres. Mary Lou Sarazin went to Paris to teach. When the job ended, she was newly married to a French husband and pregnant. Her visa had expired, however, and she couldn't renew it right away, so she returned to New York a little over a year ago to finish graduate school and have the baby. Sarazin, 34, has since received health care in both France and the United States. Her experience has given her a firsthand look into why France has earned a reputation for being a good place to be pregnant and have a child. In New York, pregnant and unable to find work, Sarazin couldn't find health insurance that she could afford. Eventually, she did get limited coverage through New York Medicaid, the state program for the poor and uninsured, but it only covered her prenatal and hospital care. Once the baby was born, she would be uninsured again. "I just felt like when I was in New York, it was always stress, stress, stress," she says. "I just didn't like the care I was receiving. And I didn't want to stress out about something I shouldn't have to stress out, not at the time of my pregnancy." At the same time, a good friend back in Paris was also pregnant. She kept telling Sarazin about her easy access to prenatal care, the nurses who made home visits and how she'd already gone on paid job leave, months before her baby was due. So Sarazin headed back to Paris to have her baby. "In France, it just seems that it's so family oriented," she says. "A pregnant woman is seen and regarded as a special moment." 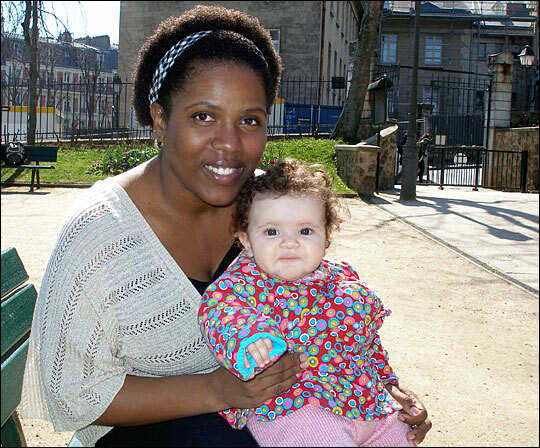 On a cheery spring day, Sarazin finds a park bench in the sun with Ludivine, her daughter, who was born in November. Ludivine has curious brown eyes. She's bundled in a knitted pink sweater and matching booties made by her French grandmother. Mother and daughter get approving smiles from people who pass by. "One thing I love about here is, once you have a baby, people are the nicest," Sarazin says. "They're just incredibly, incredibly kind." In France, she has found affordable health care that's easy to get and easy to use. Medications are provided free or at a deep discount by the national health insurance system. National insurance also reimburses 70 percent of the cost of a visit to a doctor. The rest gets picked up by supplemental insurance, which Sarazin and her husband, a municipal bus driver, purchase for a small monthly fee. Almost 90 percent of people in France have supplemental insurance, and it's often paid in full or in part by one's employer. Sarazin says she misses the United States. However, if she and her husband have more children, she says they'll stay in France. Tanya Blumstein is another American mother who experienced health care when she was pregnant in both the United States and in France. On a Friday afternoon, she and her husband, Tomas Lacronique, pick up their 14-month-old daughter, Ella, at the home of a nearby day care provider. Ella puts out her arms and squeals in delight. The private day care is heavily subsidized by the French government. Tanya moved to France after college to work in the film industry. After she met Tomas, his company sent him to work in New Jersey, so they traveled back and forth between Paris and New York. 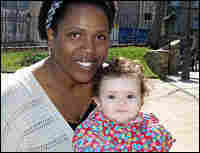 When Tanya got pregnant, she moved to Manhattan to be with him. In the United States, Tomas had insurance from Blue Cross Blue Shield. Tanya couldn't get on his policy, however, because they weren't yet married. She tried to buy health insurance for herself, but every American insurer turned her down. The reason: She was pregnant. "They said, 'We don't insure a house on fire,' " she says, remembering the unpleasant euphemisms insurance agents used to explain their rejections. "I had a 'pre-existing condition,' which was pregnancy. I just couldn't believe it." Blumstein and Lacronique went to City Hall in New York and got married, and then she was added to her husband's insurance. But even then, they found the American system daunting. There were so many decisions to make, so much terminology to figure out and so much care to coordinate. Their insurance covered major things, such as the labor and delivery, but not totally. And other care, like hiring a midwife, was considered "out of network," which meant the couple would have to pay for a lot of it themselves. "I have my notes here," Tanya says in the family's walk-up apartment in Paris, as she pulls out a stack of papers. "I was trying to navigate all this. And so, my questions: I was like, wait, what is deductible out of network? What is co-insurance? Will they pay at New York rate if submitted to local, because it was a New Jersey thing? And first visit $3,000, follow-up $175. Out-of-pocket L and D package is $5,000. And then this midwife is only out of network — $7,500 fee for being out of network, plus deductible." Tanya and Tomas loved living in New York and being in a country where there was so much choice and where it was so easy to be a consumer — except, as they found out, when it comes to health care. "Everything is so simple when want to get a cab, or rent a car, or take out, eat fast food," Tomas says. "But once it gets to serious issues — your health — then it gets hellish." Late in her pregnancy, Tanya left Tomas in New York and returned to Paris to have her baby. Tomas later changed jobs to be with his family in France. Tanya says health care in France is a lot easier to use. There is a neighborhood health clinic, where she can show up with the baby anytime, with or without an appointment. She gets letters from a local health authority telling her what benefits are available and when she should come to a clinic with her daughter for her regular checkups. When Ella got a stomach flu earlier this year, a doctor made a house call at 3 a.m. on a Sunday. It was paid for entirely by health insurance. This is the kind of comprehensive coverage that gets France's health care rated the best in the world by the World Health Organization. It's also why France has some of the world's lowest infant mortality rates and some of the highest birth rates in Europe. To the French, all of this care is intended to help parents succeed and to make sure children grow up healthy, says Victor Rodwin, who studies the French health care system. "When you're a new mother, you're very well taken care of in France," says Rodwin, a professor of health policy at New York University, who is also affiliated with the International Longevity Center. "They take very good care of their mothers when they're pregnant. There's, of course, no problem of uninsured mothers. They get good prenatal care, and they have house visitors — nurses who come to the house and help the first week." Those visiting nurses are key to making the system work. They're sponsored by their local Maternal and Infant Protection Service and are sent to make home visits to pregnant women and to parents and their babies. Nadege Heurtebise is one of those nurses in the city of Chartres. She wears black Chuck Taylor sneakers and drives a small car to the brightly painted apartment of Isabelle and Yannick Fourcade. Their son Clement was born two weeks ago. The nurse asks how the baby sleeps and eats. She tells the parents about vaccination schedules and well-baby visits, and about their options for subsidized day care. She weighs the baby and then watches the mother breast-feed to see if there are any problems. The visit takes an hour, which is about average for a home visit. It costs the young parents nothing. There is not even paperwork to sign. On the drive back to her office, Heurtebise explains that there is an advantage to going to a family's home instead of waiting for the family to come to the doctor. In the home, the nurse can spot a problem before it becomes dangerous, such as a child who is not eating or parents who are doing something incorrectly. "I never tell them what they're doing is wrong," Heurtebise says. "I just tell them something else is possible." For almost all of her home visits, though, her job is simply to reassure new parents that they are indeed doing a good job. One thing nurses do not do is the family's laundry, contrary to what some Americans may think after watching the Michael Moore documentary Sicko. The movie contains a memorable scene where a state worker goes to a new mother's home to do her wash.
Back at Heurtebise's office, her boss, Dr. Marie-Paule Martin, says she saw Sicko, too. "I had a great laugh," she says with a smile. "With Michael Moore, it's very caricature." A state-paid housekeeper will do a mother's laundry only in certain situations, she says, such as when there is a medical complication after the birth. Or, in situations where there is reason to think a mother is neglecting her children, workers may go in to try to stabilize the family. Even without laundry service, French health care comes at a high cost. There are questions about how long France can sustain it. The health system ran a nearly $9 billion deficit last year. The government of President Nicolas Sarkozy has since proposed that people should pay more of the cost for their own care. Nonetheless, even under pressure to put the system back in the black, the basic benefits to mothers and their children remain the same.